ConceptDraw DIAGRAM is a software for making infographics illustrations. Using this software extended with both Spatial Infographics and Winter Sports solutions you are able to produce professional looking infographic maps related to global sporting events, such as Winter Olympic Games. The Spatial Infographics solution allows users visually present various geographically distributed information. The Winter Sports solution delivers a rich set of vector sport pictogram, samples and templates allow producing visual materials related to sporting events. The Winter Sports solution from Sport Area of ConceptDraw Solution Park contains winter sports illustrations and diagram examples, templates, and vector sport pictogram libraries. This example was created in ConceptDraw DIAGRAM using the 'Winter Sports Symbols' library, from our Winter Sports Solution. An experienced user spent 15 minutes creating this sample. 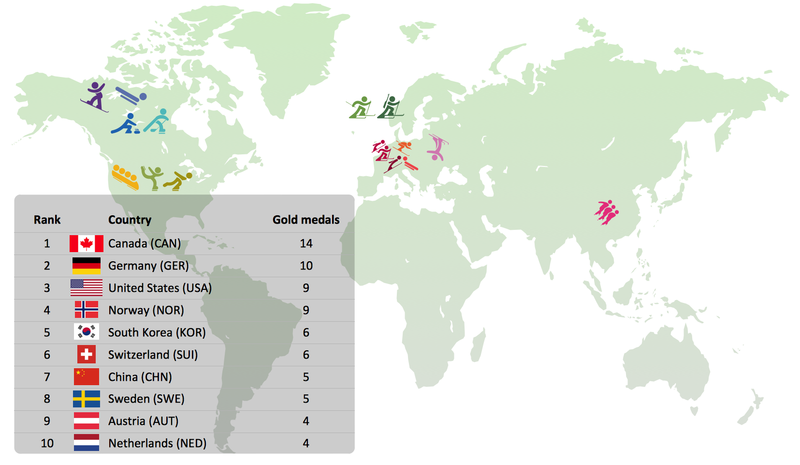 Whoever you are, sports fan, blogger, or journalist, you may be interested in tracking Olympic results. This is a good example of an illustrated table you may easily modify, print, or publish on web. The Involvement Matrix can identify the distribution of responsibilities and identify roles in a group or team. Use the Involvement Matrix to specify roles and responsibilities of actions in problem solving. ConceptDraw Office suite is a software for corrective actions planning. Every company meets some risks during project life cycle. It’s easy to face them using such tools as SWOT analysis matrix diagram that depicts Strengths, Weaknesses, Opportunities and Threats of any proposed subject. ConceptDraw Solution Park contains excellent templates of of SWOT and TOWS matrices. Making SWOT matrix is frequently used in practical marketing. It is the valuable tool of marketing strategy development. SWOT matrix allows to define the strengths and weaknesses of the organization, possible outside threats and opportunities and evaluate the current strategic competitors. Using ConceptDraw SWOT and TOWS Matrix Diagrams solution you can perform SWOT analysis. You can create a SWOT matrix in and then compare the strengths and weaknesses of your organization and the opportunities and threats of market. The well-performed SWOT-analysis allows you define the steps that can be taken for the improvement of your company market position and determine and problems that need to be solve urgently. An example flowchart of marketing analysis shows main steps you have to challenge writing a marketing analysis. Use it to make professional looking documents, presentations, and websites illustrated with color scalable vector clipart for geography, weather, and animals.